Main engine DEUTZ 170 HP from 2007, cooled by keel cooling. 12 x 2v batteries recharged by the engine, the shore power and the 6 solar panels. Electric autonomy for 5 or 6 days, according to the owners, for the fridges, freezer, TV, lights and computer. 1 generator VETUS less than 150 hours. From a bare shell built in 2004, the current owner built himself a very professional cruising home and took just two years to do it! (2007 to 2009). Almost 25 meters long on a 4,85 meters beam this design squeezes a maximum from the overall dimensions. Two side doors to enter in the saloon and living room and with two glassed doors on stern which opening onto a huge terrace with table and chairs. The terrace can be covered by a "bimini" type canvas and 2 steps lower the aft terrace gives access to the engine room. On the side of the rear doors are two lockers for electric sockets, closed with wood doors. Paint on the decks and wood on the terrace. A handrail goes all around the boat for safety . Inside there are 2 levels. The first one for the saloon, the living room and the helm, and is a continuation of the sides decks and the terrace in typical "Sedan" style . The lower deck level is just 6 steps down from the saloon, and houses the galley, the main owners cabin, heads, wetroom and the guest cabins. The helm has a central position and is well equipped with navigation instruments, included a computer. The wheel is from second world war wreck found in Dunkerque, and proudly refurbished by the owner. The engine room accommodates, the engine of course, but also the generator, the central heating boiler, many pumps, the hydraulic system, the major part of the electric panels, the hot water heater and a workshop. The wheel is hydraulic and has a second back-up hydraulic system to take its place in the event of failure. If the hydraulic system is totally out of order, there is a manual wheel and a tiller. On the bow, a crane of 2,4 tons, is able to charge a SMART included in this offer. The boat is equipped with 3 spud poles, the system is on board but the poles have been removed. Solars panels on the roof and a hight tech TV antenna. Last survey and homologation in 2010. New exterior paints as expected in 2018. Terrace, saloon, living room and steering position are on the same level. The steering position is central and with a good visibility. Wood floors, oak. Modern design furniture, to be note a second hand chest of drawers, restored by the owner. The sofa can be transformed into a double bed. Six steps lead to the galley, the main cabin, a day heads. Stainless steel floor for the steps and the galley. The galley is huge and well equipped, dish washer, fridge and 2 wine cellars under the floor. The rear galley is appreciable for its size and its little fridge and micro-wave cooker. The main cabin has a walk around bed of 160 x 200 cm and a private shower. Wood floor. 1 electric heads. One step lower toward the stern, a large corridor leads to the 2 guests cabins, one with a bed of 140 x 200 cm and the second with two beds of 90 x 190 cm. In the wetroom, there are an electric toilet, a basin, a hip bath and the dryer and the washing machine. Natural fibre floors. All domestic equipment, machines & furniture, seen on this web page are not included in this offer but may be available by separate negotiation. Boatshed Bourgogne has the pleasure to present you a very original boat, built from 2007 to 2009 by the current owner who has a professional boat building background. Just look at the equipment & machines and it is easy to see that this has been conceived by someone who knows what is needed!! A boat with, "all the comforts of home" and yet better than a home because it's a boat. 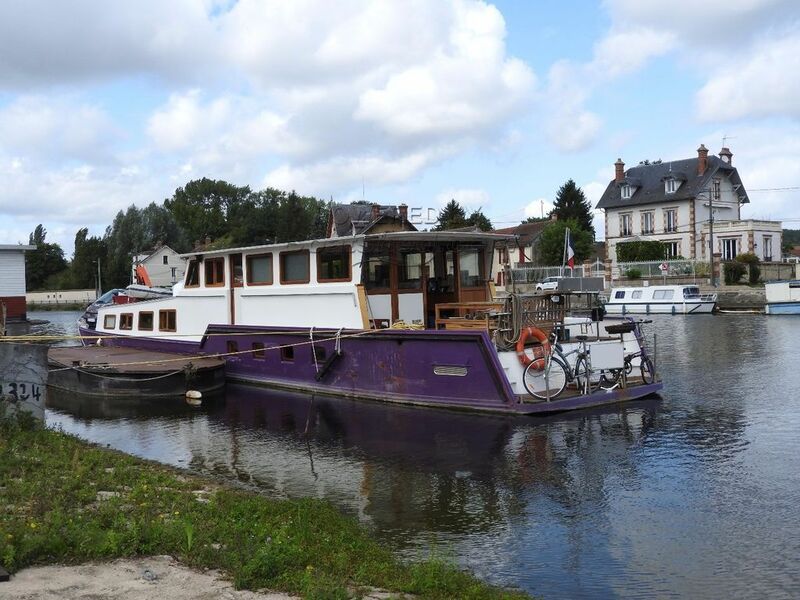 A well thought and well equipped boat for cruising the French waterways and canals & rivers of Europe beyond. For more information and appointments to view, please contact, Graham WHARMBY, your Boatshed broker at Boatshed Bourgogne. This Residential Barge Unique Cruising Home has been personally photographed and viewed by Cathy BOUGUEREAU of Boatshed Bourgogne. Click here for contact details.